This article is a short summary of Mario vs. Donkey Kong. 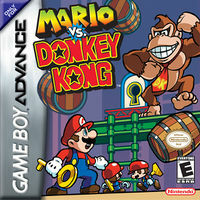 Mario vs. Donkey Kong is a 2D puzzle-platforming game released for the Game Boy Advance in 2004. Developed by Nintendo Software Technology Corporation, the game marks a return to the classic Donkey Kong arcade formula, serving as a spiritual successor to Donkey Kong for Game Boy as well as launching the Mario vs. Donkey Kong series. For the first time in ages, Mario squares off against his original foe! Donkey Kong just made off with all the Mini-Mario toys, and now it's up to Mario to chase his long-time nemesis and retrieve the stolen goods. Jump, man! Leap and battle through increasingly difficult levels as you use switches, conveyor belts, hammers, and more to overcome the hordes of enemies that block your way. You need brawn...and brains! Figure out the best path, then break out new Mario-moves like the handstand to track down keys, collect gifts, and navigate perilous platforms across barrels of levels. KO DK! Before battling Donkey Kong at the end of each world, collect all the Mini-Marios and lead them to safety. Mario squares off against his original foe--and this time with extra help! Donkey Kong™ just made off with all the Mini-Mario toys, and now it's up to Mario™ to chase his long-time nemesis and retrieve the stolen goods. Leap and battle through increasingly difficult levels as you use switches, conveyor belts, hammers, and more to overcome the hordes of enemies that block your way. You need brawn...and brains! Figure out the best path, then break out new Mario moves like the handstand to track down keys, collect gifts, and navigate perilous platforms across barrels of levels. Before battling Donkey Kong at the end of each world, collect all the Mini-Marios and lead them to safety! Donkey Kong is channel surfing when he comes across a commercial for the new Mini-Mario toy. Desiring one for himself, Donkey Kong immediately heads to the toy store, only to find that they are sold out. Donkey Kong, however, notices the Mario Toy Company, so he raids the factory and steals several Mini-Mario toys. Mario catches Donkey Kong outside and chases after him. Mario vs. Donkey Kong features similar gameplay to the Game Boy iteration, in which Mario must navigate each stage by jumping and climbing to find the key and open the door, taking the player to another area where they must save a Mini-Mario. Each world contains seven stages, the seventh of which being a stage in which Mario must guide the Mini-Marios to their box, followed by a boss battle with Donkey Kong. Mario retains all of his movements from the Game Boy release, as well as being able to use Hammers and pick up objects to attack enemies. At the end of each stage, the player's score is tallied up, and they will earn a star by surpassing the level record. Each stage also contains three presents; collecting all of them allows the player to play a minigame to earn extra lives. Using the e-Reader, the player can access additional stages. While twelve stages were made for the game, only five level cards were released. The e-Reader functionality was removed for the PAL release. Mario vs. Donkey Kong Nintendo 3DS (Virtual Console) WW: December 15/16, 2011 A digital release of the game for Nintendo 3DS, exclusively to those who qualified for the Nintendo 3DS Ambassador Program. EU/AUS: September 17/18, 2015 A digital release of the game on the Nintendo eShop for Wii U, with added emulator features. This page was last edited on 13 October 2018, at 22:16.